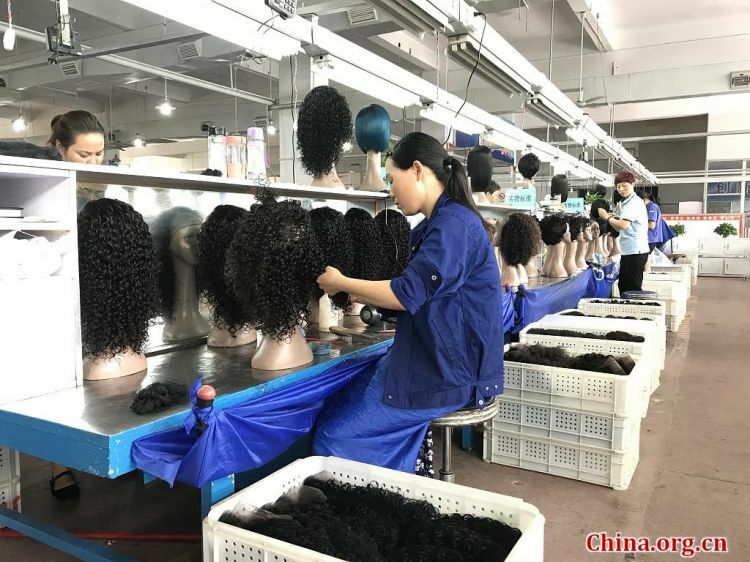 The top buyers of Chinese-made wigs are customers from the U.S. and the U.K., as balding has become a growing problem for people around the world, revealed a recent report by AliExpress, the online global retail platform of Chinese e-commerce giant Alibaba. Over 80 percent of the wigs sold on the platform were made in China, and on average, one wig was sold every two seconds in 2018. Americans also bought 800,000 pairs of underwear on AliExpress last year, while Russians purchased five million pairs of silk stockings. These are just a drop in the bucket when it comes to items that make life easier for people outside of China. Last summer, I was surprised to notice that my German friend was using a power bank from the Chinese electronics brand Xiaomi, which he bought online. But in reality, it's a no-brainer that products made in China are benefiting the world, be they iPhones or wigs. According to an article published on The Economist in March 2015, at that time China produced about 80 percent of the world's air-conditioners, 70 percent of its mobile phones and 60 percent of its shoes. Data from National Bureau of Statistics of China show that the GDP of China in 2017 was 82.71 trillion yuan (about US$12.38 trillion), to which the manufacturing sector contributed 24.27 trillion yuan, accounting for 29.34 percent of the Chinese economy. This means manufacturing is a pillar of the country's economy. However, this doesn't always paint a rosy picture of China. Manufacturing in China goes hand-in-hand with environmental damage. Though China has improved its air quality to some extent, it still faces the hardest challenges, with the whole situation still "grim," said Li Ganjie, the Minister of Ecology and Environment, at a press conference on the sidelines of the second session of the 13th National People's Congress (NPC) earlier last month. The number of good weather days in 338 major cities rose to 79.3 percent in 2018, up 1.3 percentage points from a year ago, Li released. Meanwhile, the Beijing-Tianjin-Heibei cluster saw its average density of PM2.5, the very small particles that are most harmful to human health, drop by 11.8 percent year over year. Limiting pollution has been identified as one of China's "three critical battles," along with poverty eradication and controlling financial risk. Premier Li Keqiang has vowed in his government work report on March 5 that sulfur dioxide and nitrogen oxide emissions will be cut in 2019 by 3 percent, and that there will be a continuous decline in PM2.5 density in key areas. The government also vows to accelerate the pace of forestation, and to plant 6.67 million hectares of trees each year so as to increase its forest coverage rate to 26 percent by the year 2035. As one of the people who applaud China's anti-pollution efforts, Michael Greenstone, the University of Chicago's Milton Friedman Distinguished Service Professor of Economics and director of the Energy Policy Institute, said, "It took about a dozen years and a recession for the United States to achieve the same percentage reduction in particulate pollution that China has achieved in such a short time." Despite this praise, China needs to strike a delicate balance between economic growth and environmental sustainability as it sets its lower yet still robust economic growth target at 6.0 to 6.5 percent. This will not only benefit China but the world as a whole.